The Cherry RC80 has been discontinued. No direct replacement is available. 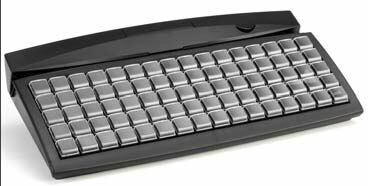 The Cherry RC80 keyboard features customizable color keycaps which allow for easy visual recognition of common functions. This not only reduces transaction time, it also helps train new employees. The result is faster transactions and happier customers! Known for their reliability, Cherry keyboards also minimize downtime, keeping checkout lanes flowing freely and smoothly. All models are backed by a three year warranty. All RC Series keyboards feature the ability to plug-and-play upon completion of configuration. Cherry keyboards also feature unique programming software, which allows for quick product set-up and program configuration.